I must admit I have a weakness for make-up. I love to know what is new and explore new techniques for applying make-up. So as I was walking past Sephora one day, I was drawn into the store with their huge assortment of 'stuff'. I usually shop at department stores for cosmetics but Sephora has become my new store of choice. I love their young, helpful sales staff. I was immediately greeted by a girl who was extremely knowledgeable. She knew about all of the different perfumes, unlike the staff at the department stores who tend to focus on one or two brands. I love that you can select 3 samples of perfumes at no charge. What a great way to try a new scent without having to spend close to $100.00. One I selected was Brit by Burberry. I love their Beauty Insider Points Card. Signing up at the cash was quick and easy and even if you don't have your card, they can add your points with the phone number on file. Points are accumulated on every purchase and can be redeemed for free products at certain levels. And I love that I got a free birthday gift! As a Beauty Insider, when you go to the store during the month of your birthday, you are given a free gift. Despite that fact that my birthday was 2 weeks ago, I was given a gift of 2 lip treatments. How nice! And what did I purchase that day? 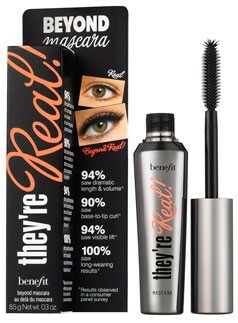 I was in need of some mascara and they recommended "They're Real Mascara" by Benefit - apparently the World's #1 mascara. I love it! Check out their website too for lots more great info.